After four Michael Balcon productions in Rarities 10, we revert here to the more familiar pattern: two earlier films from the years in which Basil Dean ran the show at Ealing, alongside two that were made after Balcon took over. 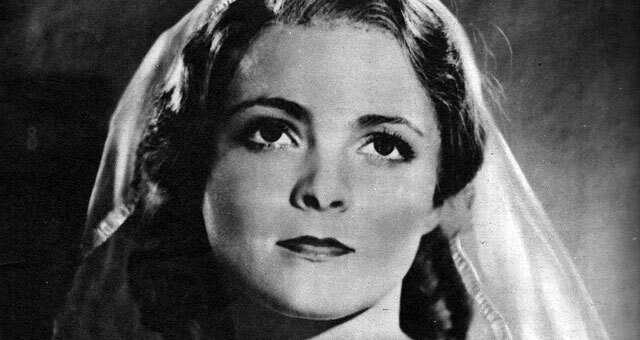 Lorna Doone, a film of the R.D.Blackmore novel set in 17th-century Devon, was very much Dean’s personal project: chosen and directed by him, and starring his second wife Victoria Hopper. Neither her career nor their marriage lasted beyond his departure from Ealing in 1938, though she lived until 2007, having given a sad interview a few years earlier to Matthew Sweet for his excellent book on British film history, Shepperton Babylon. 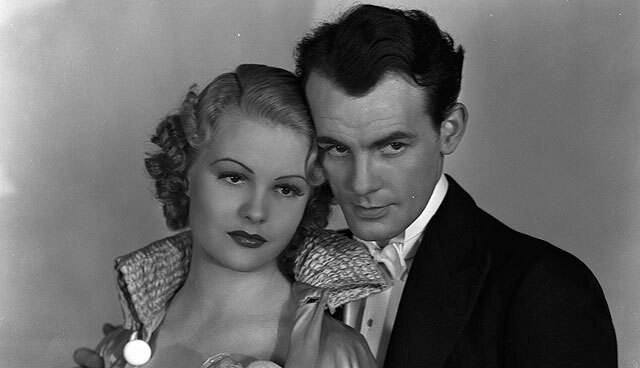 In Lorna Doone, as in its successor Whom the Gods Love (Rarities 9), the star combination of Hopper and John Loder is unexciting, but the supporting cast provides good compensation, notably Margaret Lockwood in her first film part, and George Curzon as an unlikely James II. And the story of a long-running rural family feud offers plenty of diverting detail and vigorous action..
Cheaper, quicker and less ambitious, Calling the Tune is a far more interesting film, at least from today’s perspective. The story is like so many Ealing ones, before and (especially) after: the honest struggle of little people against powerful forces that threaten to exploit or obliterate them. The site of this particular struggle is the evolution of the gramophone industry, from early days to the 1930s; it yields some remarkable technical detail, including early attempts at video-recording carried out by Eliot Makeham, one of the host of great British character actors who live again in these restored prints. Above all, this story of the recording industry accommodates a range of artists performing for the microphone in generously extended sequences: they include comedian George Robey, actor Cedric Hardwicke reading Shakespeare, Henry Wood (of Prom fame) conducting an orchestra, and the infamous ‘Laughing Policeman’ doing his number in full – and singer Adele Dixon, uncannily anticipating the prominent role she would have in broadcast TV when it restarted after the war. The plot is worked out efficiently enough, but it is these ‘attractions’ that make the film such a welcome rediscovery. Most of the familiar films from Balcon’s time at Ealing belong to mid-war and after, from the time when the studio’s distinctive identity and long-term team had become securely established. This DVD series does a great service by reviving so many of the obscurer titles from his exploratory early years there, 1938-1940. Return to Yesterday is the ninth of the first fourteen Balcon productions to be included among the Rarities so far. It features a number of the solid early team who would soon disperse in different directions, most of them, as it happens, after three films. Director Robert Stevenson and star Anna Lee went to Hollywood; cinematographer Ronald Neame (busy at Ealing since the Dean years) went to work for Michael Powell and David Lean, and then to produce and direct; editor Charles Saunders moved on likewise. The case of the film’s star, Clive Brook, is of special interest . When Balcon began his career as producer at Islington in the early 1920s, with a team that included the youthful Alfred Hitchcock, Brook was star of his first three films before making a success in Hollywood. When Balcon took over at Ealing, he again enlisted Brook, for three films starting with The Ware Case (in Rarities 5). In Return to Yesterday, he plays a Hollywood star helping a small British rep theatre company to resist a bullying management (that familiar Ealing plot structure); having done so, he goes back to Hollywood, but in real life Brook would stay in Britain, leaving Lee and Stevenson, plus co-star Dame May Whitty, to make the trip. All of this makes a neat subtext to a film which is fresh and enjoyable on its own terms, not least for its locations on and off the coast of an unflooded Devon. 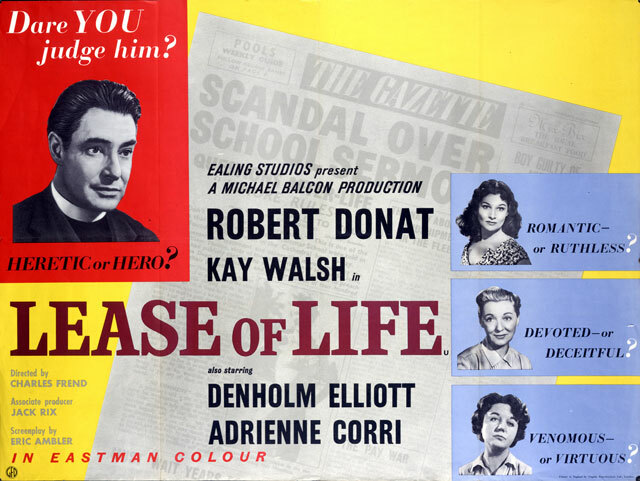 Lease of Life is among the least dramatic of film titles, and the film itself is one of the most modest of Ealing productions; in his index to ‘British Sound Films’ David Quinlan calls it a ‘sincere, quiet, close-to-dull drama.’ But it is far from dull, if you give it a chance. 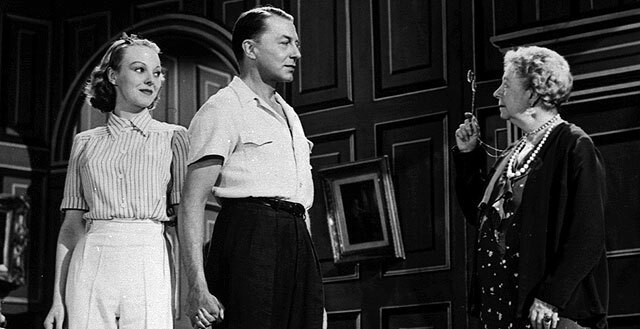 Five minutes into it, the clergyman protagonist reports his failure to get a parishioner interested in reading The Thirty-Nine Steps, a neat in-joke since the clergyman is Robert Donat, star of Hitchcock’s film, here in his penultimate role before his death in 1958. The country-parish narrative is far removed from the breathless adventures of Buchan and Hitchcock, but there is one unmistakable link. As Richard Hannay, Donat has to improvise a speech to a Scottish political meeting, and does so triumphantly, expressing a Utopian vision of goodwill between individuals and nations. As the clergyman, Donat has to preach a high-profile sermon which may lead to a well-paid chaplaincy, but he throws away his dull text and instead speaks eloquently from the heart, losing the chance of the promotion but being true to the values of himself and family and community – a finely-judged piece of writing by Eric Ambler, who had collaborated earlier with director Charles Frend on The Cruel Sea. In some ways it feels like a TV play – a portent of the forces that would help to doom Ealing – but it combines the domestic strengths of that format with elements that go far beyond the range of 50s TV in casting and colour and Yorkshire locations, beautifully shot by Douglas Slocombe. You cannot fully grasp the achievement of Ealing without taking into account films like this, alongside all the comedies, and all the heroics of Scott of the Antarctic and the war films. No film encapsulates the values of Balcon’s Ealing better than Lease of Life. A global byword for cinematic quality of a quintessentially British nature, Ealing Studios made more than 150 films over a three decade period. 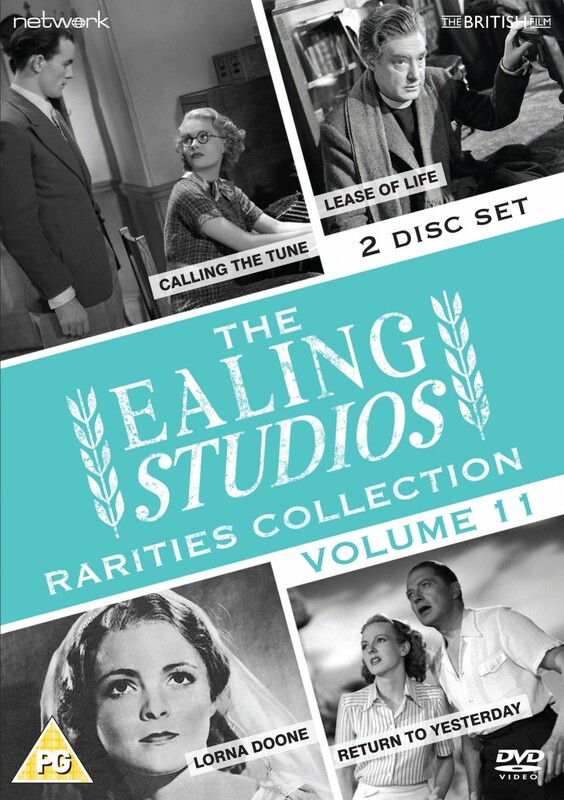 A cherished and significant part of British film history, only selected films from both the Ealing and Associated Talking Pictures strands have previously been made available on home video format - with some remaining unseen since their original theatrical release. The Ealing Rarities Collection redresses this imbalance - featuring new transfers from the best available elements, in their correct aspect ratio, this multi-volume collection showcases a range of scarce films from both Basil Dean's and Michael Balcon's tenure as studio head, making them available once more to the general public. Margaret Lockwood makes her screen debut in this adaptation of R. D. Blackmore's classic tale of two feuding West Country families during the seventeenth century. The story of the love between the daughter of a record manufacturer and the son of the man he had cheated, set during the early days of the gramophone industry.